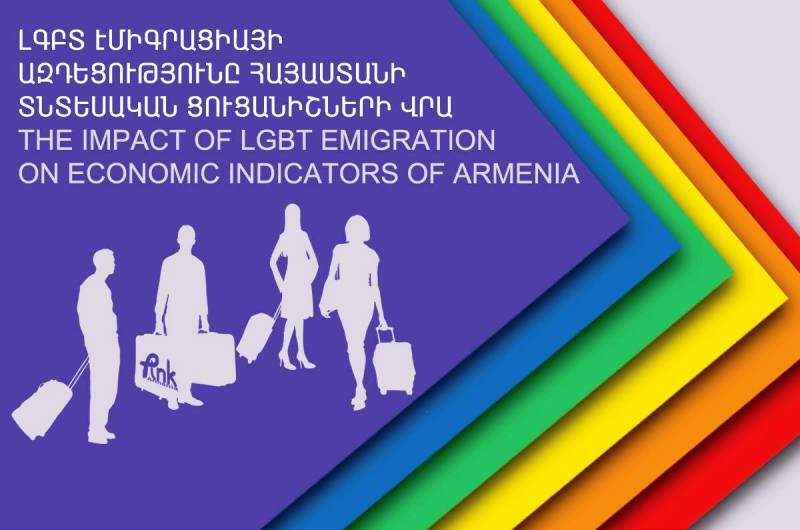 Public information and Need of Knowledge and “Socioscope” Societal Research and Consultancy Center NGOs prepared a report about the LGBT emigration impact on economic indicators of Armenia. The purpose of the project was to study the impact of LGBT emigration on economic indicators of Armenia during 2011-2013 as a result of discrimination against the LGBT community and to reflect those changes in a long-term perspective. The calculations made by this study demonstrate that, for a citizen of Armenia of average demographics who emigrated during the years 2011-2013, a minimum of the equivalent of $3,545 was spent on education. According to approximate estimates, 5,891 citizens of Armenia emigrated due to discrimination during the years 2011-2013, which implies that society has lost around $21 million in one go only in terms of educational investment toward LGBT emigrants. As for income not received, the calculations reveal that, in the year following emigration during 2011-2013, Armenia did not receive $88,365,000 across three years and for all LGBT emigrants. This is the loss following only one year after emigration, but that loss is prevalent in reality in all the years until the emigrant reaches retirement age. Budget revenues for all three years taken together – 2011-2013 – could have been more by $20 million had the LGBT individuals who left due to discrimination remained. As a result of the emigration of 5,891 LGBT individuals, the state budget will lose around $2 billion in revenue, at purchasing power as of January 1, 2014, over the course of more than the following 36 years (until retirement). And as a result of LGBT emigration in the following twelve years, from 2014 to 2025, Gross domestic product (GDP) will have a loss of $3 billion at purchasing power as of January 1, 2014, adjusted for Purchasing power parity (PPP), while the budget will lose $370 million at purchasing power as of January 1, 2014. The full report consists of sociological study and economic assessment. Read the full report with all its findings here.